Underemployment occurs when workers' jobs don't use all their skills, education, or availability to work. According to the Organization for Economic Cooperation and Development, there are two types of underemployment: visible and invisible. Visible underemployment includes employees who are working fewer hours than is typical in their field. They are willing and able to work more hours but cannot get full-time employment. They often work two part-time jobs just to make ends meet. Invisible underemployment includes workers in full-time jobs that don't use all their skills. This type of underemployment is almost impossible to measure. It requires extensive surveying that compares workers' skills versus job requirements. The workers often don't even realize their skills could be better used elsewhere. There is another category of underemployed who fall into a statistical no man's land. Even though they don't have a job, they aren't counted among the unemployed by the U.S. Bureau of Labor Statistics. Why not? The BLS only includes those who have looked for a job in the last four weeks. Instead, the BLS calls them "marginally attached to the labor force." They have looked for a job sometime during the last year, would like to work, and are available. Within that group, there is a sub-group who have just given up looking for work altogether. The BLS calls them "discouraged workers." They are also underemployed. Underemployment also includes those who work full-time but live below the poverty level. That's according to Paul Osterman, co-director of the MIT Sloan Institute for Work and Employment Research. This category is also known as the "working poor." According to Osterman, "The labor market is just not delivering for Americans what it should be delivering." This definition of underemployment includes everyone who makes less than $11.83 an hour, according to 2018 poverty level data from the Department of Health and Human Services. A recession and the resultant cyclical unemployment may cause underemployment as well. When workers outnumber jobs, they will take anything they can get to pay the bills. Technological change also causes underemployment. For example, ATM machines and mobile banking have replaced the need for many bank tellers. These used to be the entry-level positions for a career in finance and banking. As a result, many college grads who were finance majors take what they can. They may wind up as home health aides, waiters, or Uber drivers. These positions aren't easily replaced by digital technology​. The effects of underemployment are similar to those of unemployment. First, both cause higher poverty levels. Without adequate income, families don't buy as much. That reduces consumer demand, slowing business growth. As a result, the nation's gross domestic product is lower, as is job growth. It's a vicious, downward spiral. If underemployment continues, workers lose the ability to update their skills with on-the-job training. They may not be able to return to their former field without training. Some retrain for different fields. Others downscale their lifestyle and accept long-term underemployment. That creates structural unemployment. Younger people may find they never get a good start to their career. Forced to take jobs that are beneath their skills, they don't get on the right track. They miss the mentoring needed to get increased responsibility that would update their skills. By the time the recession ends, they are competing with a new batch of graduates for entry-level positions in their fields. In extreme cases, youth underemployment can lead to civil unrest and violence. In 2012, one-fourth of all young people in the Middle East were unemployed. That was one of the causes of the Arab Spring. The BLS states it does not measure underemployment, as it is too difficult. But it does measure one aspect of visible underemployment. That's the category Part-time for Economic Reasons in the "Employment Situation Summary Table A. Household data, seasonally adjusted" report. It breaks out workers who are part-time because they could only find part-time work. U-3. Total unemployed, as a percentage of the civilian labor force. The current official unemployment rate may confirm current economic trends. U-4. Total unemployed plus discouraged workers, as a percentage of the civilian labor force plus discouraged workers. U-5. Total unemployed, plus discouraged workers, plus all other persons marginally attached to the labor force, as a percentage of the civilian labor force plus all persons marginally attached to the labor force. U-6. Total unemployed, plus all persons marginally attached to the labor force, plus total employed part time for economic reasons, as a percentage of the civilian labor force plus all persons marginally attached to the labor force. The current real unemployment rate is about double the official unemployment rate, designated as U-3. Underemployment has a more adverse effect on those with college or post-graduate degrees. 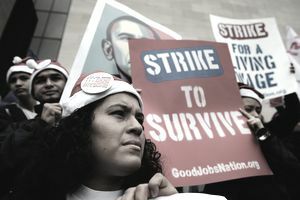 A 2012 Gallup poll asked the underemployed, which included unemployed respondents in the survey, to rate whether they felt they were thriving or not. Just a little more than half of the underemployed said they were, compared to roughly 70 percent of their employed colleagues. There was a 17-point discrepancy. Among those with high school diplomas or less, only 41 percent said they were thriving. But this was only 10 points lower than their employed colleagues. Underemployment has a greater effect on the life satisfaction for the educated than the less educated.